Posted July 30, 2015 by K.C. 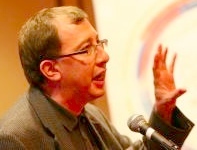 Hopson & filed under Event Rebels Blog, Meetings Technology, Mobile, Onsite, Resources Lead Retrieval, Trade Show, What's New. These devices are disappearing, for good reason. The lead retrieval units are expensive! Some of the reasons for these high costs are described below. Buying the old-fashioned units is typically done in an old-fashioned way, such as faxing or emailing a form with a credit card. By the way, this is also a violation of good credit card security practices. The hardware is proprietary, so it is difficult to explain what the units actually do when trying to sell them. 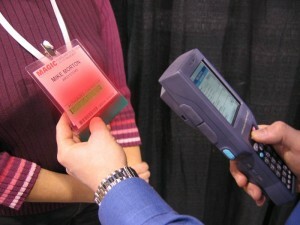 Because of the unique nature of the hardware, the vendors almost always have to fly a representative to your show, incurring additional costs. The propriety hardware has a learning curve to it, so the vendor reps often have to explain how to use the units to your exhibitors, incurring extra frustration and wasted time. Most units use 1D or 2D bar-codes which are frequently difficult to scan. Your exhibitor often has to incur the added humiliation of having to perform a scanning dance with your attendee in order for the units to work. Typically the exhibitors have to get the data sent back to them by the vendor days after the show adding to yet more frustration and inefficiency. That hot lead is now cold! Did we mention that old-fashioned lead retrieval is expensive? Easy to learn. The market penetration of the Apple/Android devices is close to 90% of conference attendees, which means almost everybody is comfortable using them. The apps are simple and easy to use. Scan in the attendee information and take notes. They do not have a bunch of extra features that nobody wants. No vendor is needed onsite, so you save big travel costs. There is no learning curve, so no training is necessary. These apps use QR codes which scan very quickly. While testing, I once printed a badge with a QR code, spilled coffee on it, crumpled it up, threw it on the ground and kicked it – and the scanning still worked great. No more scanning dances! Exhibitors can email themselves a spreadsheet at any time in a format that can be easily uploaded to their CRM system. Time to close that hot lead! Because no hardware rentals are required, they sell at a fraction of the price of the old-fashioned units. Because the apps are so inexpensive, you can mark up the sales and even make a nice commission! The apps are bought online, so the exhibitors can download the app before the show. No more risky, manual exchange of credit card information! Contact us to find out more about making your exhibitors happy with inexpensive, easy to use, lead retrieval.